According to the Puranic legend, Lord Brahma mentally created ten sons,”manasa putra”, to carry out his task of creation and destruction. This had resulted in the creation of Shiva and Daksha but Shiva had superior powers. Irked over Shiva’s supremacy, Daksha took the former as his rival. Daksha had a beautiful and virtuous daughter called Sati.She was a great devotee of Shiva.Most of the time Sati immersed in the thoughts of Shiva and dreamed of being his wife. Sati’s sincere and devotional prayers made Shiva finally appearbefore her. He asked her to choose a boon. He knew what Sati would ask but wanted her to speak for herself. After overcoming the hesitation Sati revealed her desire, which was readily granted by Shiva. Soon Sati was married to Shiva amidst numerous gods and goddesses. Shiva and Sati then went to the Mount Kailash where they spent many a happy days. One day Shiva went to Prayag, today’s Allahabad, to attend a “yagna”, a fire-worship ceremony. When Shiva entered the yagna hall, every one stood up to pay him respect. After some time Daksha entered the Yagna hall. Everyone stood up to pay respect except Shiva. Daksha felt insulted.Being a superior power Shiva did not want to harm Daksha by standing up before the latter. So in a word, Shiva did not mean to insult Daksha.To teach Shiva a lesson, Daksha announced a grand sacrificial ceremony at his home. Barring Shiva, he invited all gods and goddesses to the occasion. Against Shiva’s wishes, Sati attended this sacrifice and was insulted by her father. 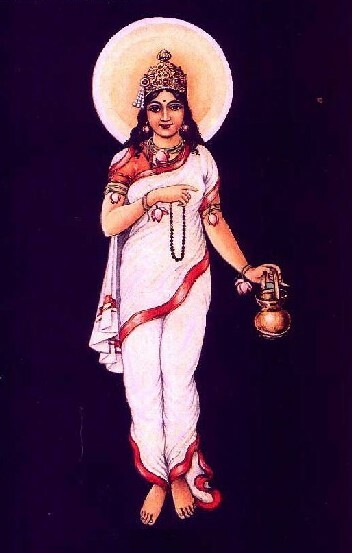 An insulted Sati consumed herself in a fire and returned to mother Earth. When news reached Shiva that his beloved wife was dead, he let out a mighty roar that shook Heaven and Earth. He destroyed Daksha’s ceremony by a huge army of demons. Shiva was about to destroy the universe, when Brahma came with other gods to calm him down. All the gods soothed the furious Shiva and pleaded with him to forgive Daksha and allow him to complete the sacrificial ceremony, which he had started, otherwise he would go to hell. Relenting, Shiva brought back to life all the people who had been killed. Finally he looked up, suppressing the power of his destructive third eye, and stated, “I will return Daksha to life, but he must bear the mark of his foolishness forever.”The gods agreed to Shiva’s condition and Daksha was revived. The mark of his foolishness was clear for all to see for instead of his own head, he wore the head of a goat. Daksha finally acknowledged Shiva’s supremacy falling at the latter’s feet. Still crazed with grief, he picked up the remains of Sati’s body, and danced the dance of destruction throughout the Universe. 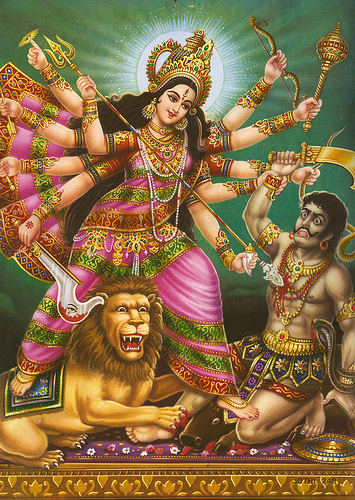 The other gods intervened to stop this dance, and the chakra of Vishnu cut through the corpse of Sati into fifty one parts,whose various parts of the body fell at several spots all through the Indian subcontinent and formed the sites of what are known as Shakti Peethas today. Naina Devi – According to legends, Sati or Parvati was the daughter of Prajapati Daksha and later, became the consort of Lord Shiva. 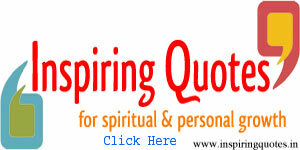 Once her father insulted Lord Shiva and unable to accept this, she killed herself. When Lord Shiva heard of his wife’s death his rage knew no bounds and holding Sati’s body he began stalking the three worlds. The other gods trembled before his wrath and appealed to Lord Vishnu for help. Lord Vishnu let fly a volley of arrows which struck Sati’s body and severed it to pieces. At the places where the pieces fell, the fifty-one sacred ‘shaktipeeths’ came into being. It is believed that Sati’s eyes fell at the place where this temple is situated. 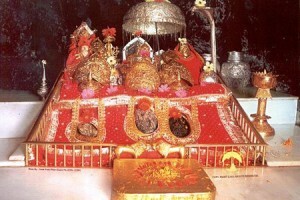 Therefore, this temple is called Naina Devi. The word Naina is synonymous with Sati’s eyes. 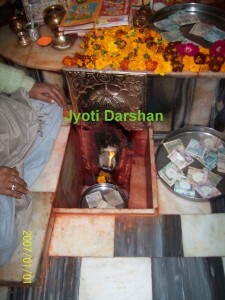 Since then, devotees started visiting this temple. Once the devotee reaches the hill top, prasad can be bought from any of the various shops or it can also one’s own offerings from home. After crossing the main gate, there is a big Peepal tree on the left side. On the right side of the temple there are idols of Lord Hanuman Ji and Ganesh Ji. After reaching the main entrance of the temple, there are two statues of lions. Inside the temple, devotees have darshan of three deities. 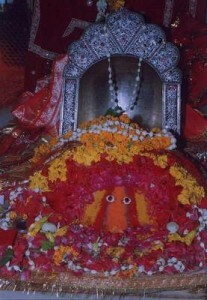 On the extreme left is Mata Kali Devi, the centre representing two Netras or eyes is Maa Naina Devi and to right side is idol of Lord Ganesh. “Chinta” Means worry ……Tension or worries act as a slow Poison. Maiya saves HER bhakts from it, giving elixir of life, by fulfilling their desires and hence rightly known as CHINTAPURNI. The sacred place belong to ‘Chhinnmastika Devi ‘ i.e. the goddess without head. Vaishno Devi is nestled in the mighty Trikuta mountain 61 kilometers north of Jammu at a height of 5,200 feet above the sea level in the state of Jammu and Kashmir, India. The shrine is visited all through the year, but the path is difficult during the winters due to snowfall. As the legend goes, more than 700 years ago Vaishno Devi a devotee of Lord Vishnu, used to pray to Lord Rama and had taken vow of celibacy. Bhairon Nath, a tantric (demon-God) tried to behold Her. Making use of his tantric powers, Bhairon Nath was able to see Her going towards the Trikuta mountains and gave chase. It took Bhairon Nath nine months to locate Her, the reason why the cave is known as Garbh Joon. 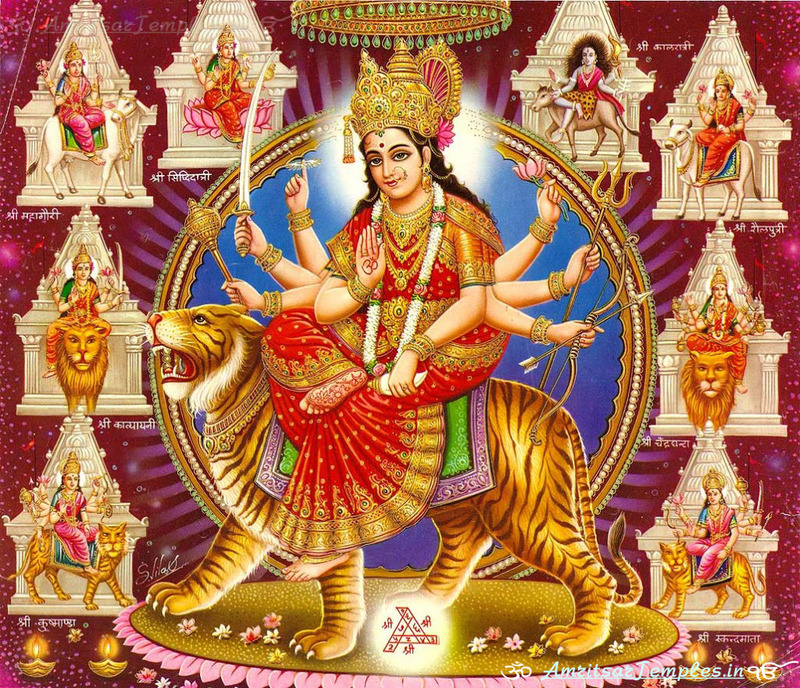 Mata Vaishno Devi blasted an opening at the other end of the cave with Her Trident when the demon-God located Her. On arriving at the Holy Cave at Darbar, she assumed the form of Maha Kali and cut off Bhairon Nath’s head which was flung up the mountain by the force of the blow and fell at the place where the Bhairon Temple is now located. The boulder at the mouth of the Holy Cave according to the legend is the petrified torso of Bhairon Nath who was granted divine forgiveness by the benevolent Mata in his dying moments. The Yatra begins at Katra and pilgrims have to cover 13 km. of terrain on foot to reach the Darbar. One kilometer away from Katra, is a place known as Banganga, where Mata quenched her thirst and at 6 km., the holy cave at Adhkawari. After 6 km. of trekking, the yatries reach Adhkawari, the holy cave where Mata meditated for nine months. The journey amidst snow capped mountains and sprawling forests arise from within the holy shrine of Maa Vaishno Devi. 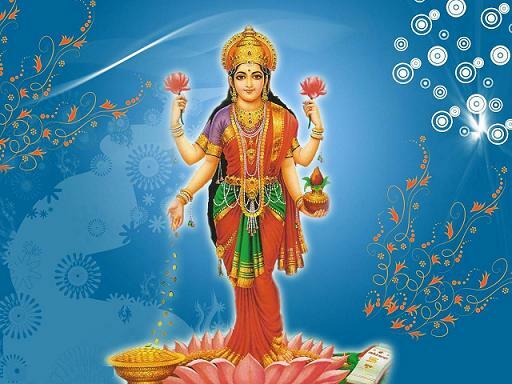 There is a common faith among the folk that Goddess-Vaishno sends a ‘Call’ to her devotees and that once a person receives it, wherever he or she is, marches towards the holy shrine of the great Goddess. A supernatural power seems to draw them through the mountain and they climb up those great heights step by step, chanting ‘Prem se bolo, Jai Mata Di’. 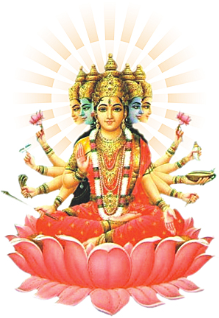 There are images of three deities – The Mahakali, Maa Saraswati and Maha Lakshmi. Chamunda Devi is a Shakti shrine, situated 10 km west of Palampur, on the Baner River. This colorful shrine has a wrathful form of Durga or Chamunda. The idol in the temple is considered so sacred that it is completely hidden beneath a red cloth. Here Lord shiva is present in the form of death, destruction & dead bodies along with Devi Chamunda. In the temple the devotees can see scenes from the Devi Mahatmya, Ramayan and Mahabharata. 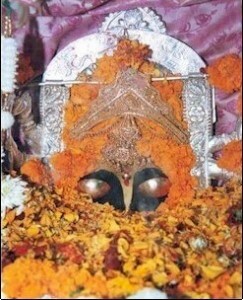 On either side of the Devi’s image is Hanuman and Bhairo. Devotees offer prayers, worship and give offerings for their ancestors. It is thought to be sacred to take a dip in Ban Ganga and to read and recite the writings of Shat Chandi. In the old days, people used to offer sacrifices also to the deity. The Goddess Chamunda was enshrined as chief Goddess with the title of Rudra in the battle between demon Jalandhra and Lord Shiva which made this place famous as “Rudra Chamunda”. 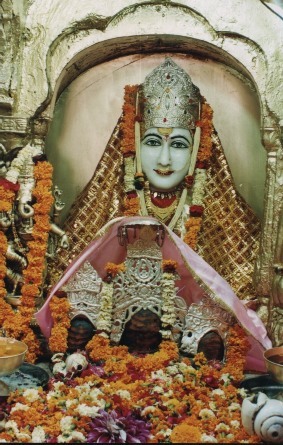 Mansa Devi (who fulfills the desires) Mansa means desire and Meri Maiya who fulfills the desire of HER devotees, is popularly known as Mansa Devi. 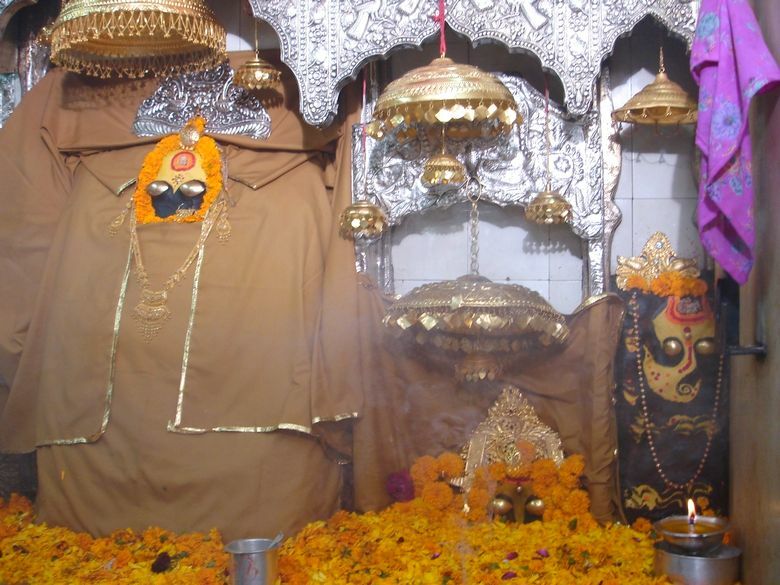 Located a top the Shivalik-Hills near Hardwar the Mandir is easily accessible through Ropeway Trolley, as well as stairs and pedestrian path The Main – idol, enshrined in the Mandir, consists of 5 heads (faces) and three arms of Meri Maiya. Pilgrims tie-up a thread around stem of an old tree for the fulfillment of their desires. One can easily see hundred of knots around it. Jwala Devi (who represents the energy of fire) Nine Sacred – Flames, continuously burning without any fuel,or assistance may be seen erupting from a rock-side, now housed in the shape of a Mandir, here. This miracle of nature is worshipped as Meri Maiya known as JWALAMUKHI. 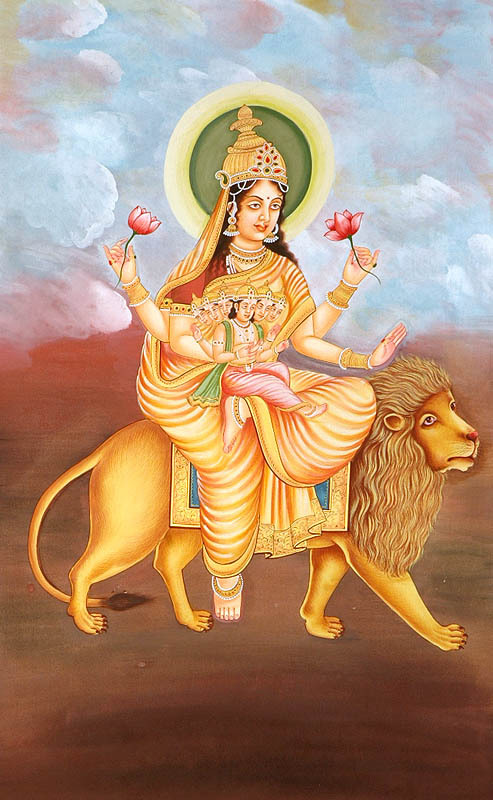 Shakumbhari Devi (A Symbol of Botanical Energy) Katha tells us that Meri Maiya helped the living creatures to survive only upon plants and vegetables, when no water was available on this earth, for full long hundred years. 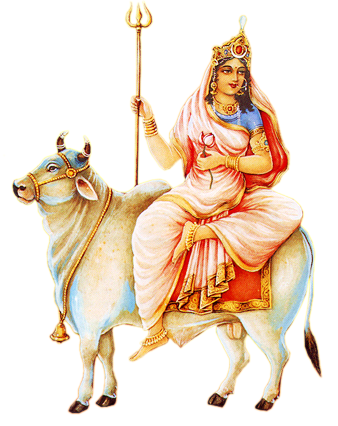 Hence, SHE was known as SHAKUMBHARI DEVI i.e. Meri Maiya who feeded upon vegetables. Here, Meri Maiya is represented by four idols. 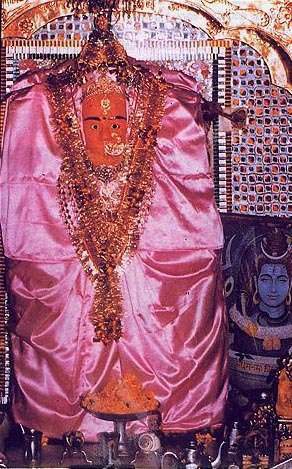 Bhramari and Bhima Devi are enshrined on the right side of SHAKUMBHARI DEVI is also known as Sheetla Devi. Actually all these names signify the same deity, who incarnated HERSELF with the different names in different ages. In present context also, this aspect of worship is utmost relevant, because the world began to think about the importance of plants and trees only a few years ago, whereas, the Indian Culture had adopted the same thousand of years before, when the worship of SHAKUMBHARI DEVI was started. This temple is situated at a distance of forty kilometres from Saharanpur ( a city in Utter Pradesh which is biggest state of India ) city in the Shivalik mountian range.